Add in the galactic extinction values. Dump the merged data into a binary file for later ingest. Calculates the "merged class" and class category probabilities from the individual object classifications from the passbands; also calculates the continuously-distributed merged class statistic requested by SJW. References TableData< DataType >::assign(), TableData< DataType >::at(), TableInfo::ColNotFound, Galaxy, TableInfo::getAttNo(), TableInfo::getTableName(), TableData< DataType >::isDefined(), Table< Numeric >::mDataPtr, Table< Numeric >::mInfoPtr, Noise, StringOps::NumToString(), ProbGalaxy, ProbStar, TableData< DataType >::qNumRows(), Saturated, and Star. 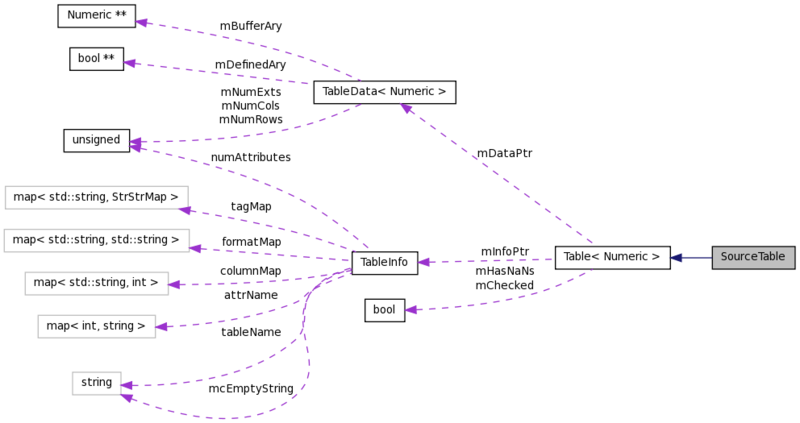 References TableData< DataType >::assign(), MergeTable::getEntry(), TableInfo::getName(), Table< Numeric >::mDataPtr, Table< Numeric >::mInfoPtr, TableData< DataType >::qNumCols(), and TableData< DataType >::qNumRows(). References Logger::addMessage(), Logger::addSysInfo(), TableData< DataType >::assign(), TableData< DataType >::at(), TableInfo::ColNotFound, ExpectNames::fileName, TableInfo::getAttNo(), Options::getOptionStr(), Table< Numeric >::mDataPtr, Table< Numeric >::mInfoPtr, StringOps::NumToString(), and TableData< DataType >::qNumRows(). References Logger::addMessage(), TableInfo::ColNotFound, DataMethod< DataType >::determineSourceAndTarget(), DataMethod< DataType >::doit(), Options::getArchive(), TableInfo::getAttNo(), Table< Numeric >::mDataPtr, Table< Numeric >::mInfoPtr, and TableData< DataType >::qNumRows(). Fill merged source positions and epochs for the given source table schema based on an astrometic solution. References Logger::addMessage(), TableData< DataType >::assign(), TableInfo::ColNotFound, TableInfo::getAttNo(), MergeTable::getEntry(), Converter::getFactor(), Options::getOptionDbl(), TableInfo::getTableName(), TableInfo::getUnits(), Table< Numeric >::mDataPtr, Table< Numeric >::mInfoPtr, StringOps::NumToString(), TableData< DataType >::qNumRows(), ExpectNames::ra, and DefaultValues::realdef. References Logger::addMessage(), TableData< DataType >::assign(), TableInfo::ColNotFound, TableInfo::getAttNo(), TableInfo::getName(), TableInfo::getNumAttributes(), Options::getOptionDbl(), Options::getOptionStr(), TableInfo::getTableName(), Table< Numeric >::mDataPtr, Table< Numeric >::mInfoPtr, StringOps::NumToString(), and TableData< DataType >::qNumRows(). References Logger::addMessage(), ByteArray::dump(), TableInfo::getFormat(), TableInfo::getName(), TableInfo::getNumAttributes(), Options::getOptionStr(), ByteArray::markColumn(), Table< Numeric >::mDataPtr, Table< Numeric >::mInfoPtr, StringOps::NumToString(), DataChannel< DataType >::output(), TableData< DataType >::qNumRows(), and selectChannel().